Please do yourselves a favor and purchase Hollywood Diva by Edward Baron Turk, Forever Young by Joan Wester Anderson, and The Purple Diaries by Joseph Egan. Only when it lives in you, will the truth prevail. Yesterday, January 10th, 2016, a music legend died. Reading reactions by longtime friends and fans of an artist that I’ve never truly had a passionate feeling for fascinates me. Perhaps it’s morbid of me to do so, but often I’ve found myself lost for hours in beautiful tributes. The tributes to David Bowie have been no exception. His death came as such an immense shock to so many, including myself, that I find the world a little bit smaller, today. We’re a little bit older and a little bit more in tune with one another. So many have expressed their plan to look to the skies and scream that it’s time to start living. That’s the funny thing about another person’s death. It makes you realize the possibilities of your own life. Now, there are many people who feel they must explain themselves and their reactions to a celebrity’s passing. I’d be lying if I said I wasn’t among them. There are those out there who seem to prey on who they might consider to be non-devotees. They tell people they’ve never met, who pour their emotions out, “You can’t feel that way. You don’t know as much as I do. You haven’t been a fan long enough.” Those are the ones that I consider to be the vultures of death. They wish to be the stars of the mourning party, to let no one else near their idol. Then there are the smaller scavengers, the “look at me, I’m so upset that I simply can’t go on another day, please watch me cry unto the Heavens, ‘why, why, why!’ and hang all your own feelings” type of people. They, too, want nothing more, it seems, than to gain their own stardom from the death of another. But then, I step back and look at myself. I constantly, and with the greatest care, tell those close to me that there are no rules, for mourning. When someone very close to us dies, a hole is left that may, over time, develop a scar, but the reminder is always there. You will have good days. You will have bad days. At times, you will have very bad days. The simple truth, however, is that we are allowed as feeling, emotion driven human beings to honor our dead in any way we see fit. That doesn’t seem to align with my petty judgements of those people I just spoke of, huh? Those people feel the same hollow ache I do, don’t they? Every Christmas Eve, I remember the phone call to tell me that my beloved Nana had died that afternoon, in 1995. It’s something that I’ll never shake. Over the years, the regrets have become more manageable, but they’re still there. Then, too, on February 17th, I say a prayer and remember Kathryn Grayson who, by the grace of God, let me call her my friend. We weren’t related, and I had only known her for 8 terribly short years, but I’ve always managed to justify doing so, because of that. But, Kayla, what about January 14th? What about August 12th? And therein lies the trouble with the community of mourners for celebrities. We will always justify our own response, but not always will we support the response of another person. There is one person out there who, should she be reading this, will know that this apology I’m making is for her. I won’t name who, but I do owe her that. There are others who may stumble across this, to whom I also owe an apology, but I must further apologize for not knowing your names. The apology, itself, is very simple. I am so sorry for being a terrible hypocrite about death. It affects all of us in various ways, and we never know, from the start, where those reactions may take us. Don’t let people like me stop you from feeling. Be true to yourself, true to your character, and show the respect you believe another human life, well lived, deserves. Don’t worry that someone with a longer list of concerts attended or movies seen or books read will judge you. The easiest way to spread the love and inspiration that you feel is by introducing others to it. Open your heart. Feel. Breathe. Love. Be that person you always were, with that joy you always had. Speak up. Behold! The Cinema Dilettante’s entry for The Loretta Young Birthday Blogathon. This post started out in a whole different way, which actually matched the working title from the roster. Then, a little writing muse said I was being a bitter old hen and needed to change it all. In the last year, I’ve heard and read many reactions to the mention of Loretta Young. Most are warm memories with many smiles and fond recollections. Some people remember Julia Brougham, who brought a little bit of Heaven to Earth. Some recall a frozen damsel named Claire Blake. The largest percentage, and I’ll dare say happiest memories, however, go to a glamorous lady who twirled into living rooms each Sunday night. Louis B. Mayer warned her against it. He said she may never be able to find work on the big screen, again. Many friends echoed the same warning- television would be a deadly blow to her film career. Indeed, it would turn out to be, but there would be no tragedy in that. Loretta Young would finally have the full control over her image that she’d worked for over her already nearly 25 year career as a leading lady. As her sister, Sally Blane, said- at an age when most women would be slowing down, Loretta took on a new challenge. Headstrong and with great dignity, she would clear the path for many female television stars, to come. The story goes that one evening, the family was watching television, and the program was so disturbing that, by the end, the children were in tears. This inspired an idea, in Loretta’s mind- after all, shouldn’t TV be capable of doing something better than what she’d just seen? Perhaps there was a way for her to get one good idea or lesson presented to the public, each week. Tom Lewis, Loretta’s then-husband, and a writer came up with a plan. The show would be called Letters To Loretta, and in every episode, she would be given a letter to read, while dressing, which she would answer by way of acting in a short teleplay regarding the issue at hand. Loretta wasn’t crazy about that idea, but eventually agreed. Several episodes were shot in that manner and aired (the first review stating “It was so bland, it won’t last one week.”), until a meeting was held with the corporate sponsor, Proctor & Gamble. They also expressed their dislike of the format, and Loretta had a small victory. Thus, The Loretta Young Show was born, and from 1953 to 1961, Loretta Young would charm and provide inspiration and insight to audiences, with only a small leave, due to illness, in 1955. It is said often that, in an act of loyalty, Loretta would hire friends and formers associates, but in an interview, she was adamant that loyalty had nothing to do with it. She, as anyone else in her position would, wanted the best and set about getting it. She had made many friends over the course of her career, and perhaps it was their loyalty to her that should be considered. From her pick of any director she thought right for a show, to having access to any costume she might need, Loretta had it. The real fact here is that Loretta was loved, not only by her audience, but by her friends and associates. Loretta Young would never call herself a victim, I’m sure of that. She would not fault some vast anti-feminist conspiracy as a reason for her contributions not being properly celebrated. While that sometimes may seem to be the case, especially when one finds grown men gleefully patting themselves on the back for pointing out how “power hungry” she was, I find that, as in other instances, it is more of a matter of us not quite understanding Loretta. In listening to and reading interviews where she talked about her show, I’ve discovered a woman who was proud of her work, but was deeply humble about the sheer magnitude of what she was doing. For Loretta, it was just “what anyone would do, in the same situation.” In many cases, I listen to her and think that she’d feel the same way if she was a lady pilot or engineer. This was the talent that God gave her and the skill she had artfully built on top of that, and she used those to spread the joy she got in doing it. As much as a few apparent members of the He-Man Women Hater’s Club would lead you to believe, Loretta Young wasn’t knocking on Hollywood’s doors to tell them how great she was, how innovative she was, how she was really just the best at everything, and like she totally did the whole show herself, she actually was all of the actors and crew. She was, as one of her sisters would later say, “regular people.” She lived a life of grace and gratitude, happy to have had the opportunity to make her show her own. I have a confession to make, everyone. In a fit of anger or angst or, I don’t know, being mad about having run out of bagels, I wrote a long diatribe about how the damn establishment was just bringing lady folk down. While that certainly is true, the more egregious omission is the one that we lady folk commit, ourselves. We will talk ten ears off about the pioneering roles of ladies like Lucille Ball and Donna Reed, but we don’t bring up Loretta. Why don’t we do that? Are we looking at her glamour and assuming that we can’t relate to her? Are we committing a lady code violation of letting our subconscious go, “LOL back up, you’re too pretty to do things that the boys’ club likes to think they’re best at.” Do we disagree with her show’s message, therefore find her behind the scenes contributions null and void? I don’t like baking pies or being domestic, but I still think Donna Stone was a pretty rad character. Loretta Young was, as that beacon of modern femininity Tina Belcher would say, “a smart, strong, sensual woman.” I propose that those of us who recognize that fact simply do our best to spread the word. She would not want anyone sitting on their hands, bemoaning the fate of her legacy and using it as a sort of sad anecdote of what happens to strong females. Sure, we need to recognize that she has been overshadowed and that there are “scholars” out there who read half of a legal decision and decided that Loretta just kicked her husband to the curb and wouldn’t let him back near her show. Then we simply correct it, with the poise that Loretta displayed throughout her life, and go on. Most of all, I think everyone could do with remembering that, even if we’re thinking, “Oh, I so do not agree with this message that is being shared in episode 33,” it doesn’t take anything away from the real and wonderful effort that Loretta put forth. Our girl did the work of three men, and it’s up to our generation to remind people of that. The Loretta Young Birthday Blogathon Is Here! Welcome, bloggers and readers, to our very first Loretta Young Birthday Blogathon, hosted by myself, Now Voyaging, and the Young Sisters Appreciation Group, on Facebook! Thank you so much to everyone who is participating! Below, you will find links to all of our brilliant contributors’ posts. Enjoy! Remember- if you have any questions, please feel free to e-mail me (Kayla) at KathrynGraysonFn@aol.com. 🙂 For those of you on Facebook who have yet to join us, by all means, please get in on the fun with the Young Sisters! And now, let the countdown begin to Loretta Day 2016! 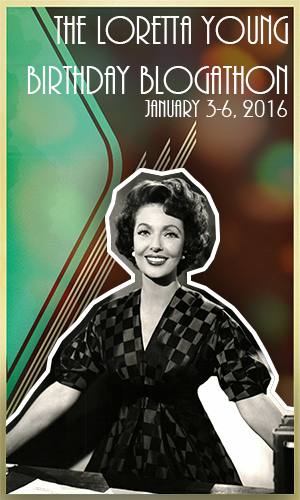 The Loretta Young Birthday Blogathon is almost here! There is still a little time and a lot of films to choose from, if you’d like to participate in the first Loretta Young Birthday Blogathon, hosted by myself and Now Voyaging! We’re pleased to announce a screening of “Midnight Mary” in conjunction with the Palm Springs Film Society on February 2nd, 2016 at University of California Riverside, Palm Desert Campus. The event is scheduled for 6:00pm and is free to the public. Exciting times, kids, so don’t forget to sign up! Irene Dunne. How do I adore thee? The ways are innumerable. As with most children of the 90’s, who were of a special brand of awesome, I was introduced to Irene Dunne through the magic muddle of public domain VHS. From Life With Father to Love Affair to Penny Serenade, we had a varying showcase of Irene’s immense talent, and a gateway to wanting to see more. My local Family Video had The Awful Truth, My Favorite Wife, and Anna & The King Of Siam. They offered more insight into her abilities. Oh, this lady was hilarious and also sang? Please tell me she also saved the world, by night. Wading through this mess of a life of mine, Irene became my sort of beacon of goodness. This isn’t to say that I believe I truly put her on a pedestal and refused to believe anything bad about her… there just wasn’t ever anything bad about her! She is God’s Della Street. It would be many, many years before I could make myself sit down and watch Irene play the role of a sort of “compromised” female, and I still maintain that Irene Dunne in an open marriage freaks me out a little bit (Consolation Marriage). When Warner Archive recently announced the release of Never A Dull Moment on DVD, though, I decided “Oh hell, it’s only money, buy all the Irene releases!” Among them was Ann Vickers. The DVD has been sort of staring me down for weeks, daring me to push aside homework and general responsibility to watch it. This past weekend, I did it. Sick of Excel and nuclei and the Federal Reserve, I took a deep breath and said, “I am a smart, strong, sens…” wait, sorry, that was Tina Belcher. What I did was more along the lines of laugh nervously and pray I could play adult long enough to enjoy a movie. What was making me so nervous about watching this movie, you ask? For starters, it was based on a novel of the same name, by Sinclair Lewis, which involved such taboo topics as abortion, adultery, and women with ideas (I know, that last one is pretty radical). Promising to be more sensational than the book, I couldn’t imagine what way the movie would be headed. Made a full year before the strict enforcement of the Production Code, RKO still faced the back and forth rejections from Joseph Breen,the Hays Office’s PR man. As we see the film, Ann Vickers is seduced by an Army captain, played by Bruce Cabot. After he has left for camp, she discovers she is pregnant. Over the course of the few, far between letters he wrote her, she comes to the realization that she has been taken advantage of. He was merely a charmer making big promises that he would never keep. Ann does not marry Captain Resnick and, instead, goes to Havana with Dr. Malvina Wormser, played to perfection by Edna May Oliver. In the original draft of the script, Ann was to have married the Captain. Breen was adamant that this, coupled with Ann’s later affair with Judge Barney Dolphin, was a prime example of what his boss, Will Hays, call “progressive prostitution.” Now, I’ll be damned if I can figure out where he came up with that phrase, as no money for services changed hands. I suppose I’ll have to remember that this is the same office that demanded Jeanette MacDonald have her feet on the floor, when kissing Maurice Chevalier, even though neither of their feet were in frame. The office simply didn’t make good sense. Personally, though, I do believe that the deletion of the marriage was for the best of the final product. It strips away a layer of vulnerability that Ann would have otherwise had- should she have married, let’s say “for protection of her name,” then the character would not be as strong as she was. In Havana, it is clear that Ann is in recovery, though we’re never told if she has had an abortion, as in the book, or if her baby died at birth. One line seems to suggest that it was a stillbirth, but there is just enough ambiguity to leave the abortion idea on the table. Now, that’s pretty ballsy, if you ask me. Portraying abortion on screen, in 1933, was about on par with lighting a statue of baby Jesus on fire while a man in a red union suit played the fiddle. This is the point in the movie where I feel Irene really became one with the character. She goes back into her life, headstrong and in control. Observing the inhumane treatment on women in prison, she threatens to talk, and the men in charge try to tear her down with some phony pictures to “ruin her reputation.” Irene was always great with characters who, simply put, threw her bag of damns to give in the dumpster. Whether they were serious or delightfully daffy, Irene could play them to the hilt. Ann walks away, writes a tell all about the revolting and disturbing abuses happening in the women’s prisons, and starts a reform movement. The only disappointment I had, in the movie, was that it felt a little rushed, toward the end. Great time and care was spent in building Ann’s life and character, and what, in the end, seemed to matter most to her was Barney and their son. The state indicts Judge Dolphin for his behaviors in taking stock tips and the like, accusing him of granting leniency toward those who “bribed him.” While we have seen that this doesn’t appear to be the case, he is found guilty and sentenced to six years of hard labor, which seems akin to the death penalty, by today’s standards. Today, the hardest thing he’d have to do in his white collar prison is learn how to use the standard cable box remote, after years of having only Dish, at home. Once the board of the reformatory find out the true paternity of Matthew, Ann and Barney’s son, she is forced to resign. She writes articles to support herself and Matthew, in anticipation of Barney’s eventual return home. She pleads his case to an old friend, only to be met with disappointment. She resigns herself to the quiet, unambitious life, dreaming of the day when she will be the simple wife of a simple man named Barney Dolphin. Naturally. She can have ideas and be a productive member of society for a while, but she has to renounce her entire life, once love comes in to play. Okay, okay, that’s harsh, but still, you get it. Overall, even with a slight disappointment in the ending, I was absolutely blown away by how powerful this movie was. It is daring for it’s time. It is dramatic without being maudlin. It is a film about a bunch of what would later be described as anti-heroes. They’re not perfect, but by God, they make you look at yourself and think, “well, neither am I, but we all deserve second chances, right?” It is the type of film that has a moral lesson, not in the virtue and righteousness in the characters, but in how we react to them. If we can root for movie characters who made mistakes, the kind that were done in the name of protecting others, or that were a simple matter of hurting no one but oneself, why can’t we do that in everyday life? Irene Dunne, ladies and gentlemen. Saving the world. Sidenote: Watch Irene try to figure out what to do with a cigarette. You know someone tried to teach her, and she was clean out of cares to give about that particular knowledge. Ann Vickers can be purchased on MOD DVD, from the Warner Archive store. You won’t regret it. Sometimes we all need a little KG. Could she be any more gorgeous?